(2) prejudice, discrimination, or antagonism directed against someone of a different race based on the belief that one’s own race is superior. There is something valuable that Aboriginal and other community based cultures can teach the rest of us. That is a deep respect for elders, a respect that oftimes extends beyond their own communities. But, in return, do non-indigenous Australians, especially their elders, necessarily return that respect? Sometimes the issue of racism can be a difficult topic to broach among those who may have been brought up in a time where skin colour difference was too often too great a social barrier to overcome. Granted, some older Australians have come to realise that there is very little that separates us at heart, but even fewer grounds to warrant ignoring or isolating “others” – those who did not grow up in a largely white, even somewhat privileged world. They have grown to respect difference and to do, as Dr Steven Covey once implored all thinking people to do: Seek first to understand, then to be understood. Many younger Australians – those who have grown up with or come to know indigenous or international peers as friends and equals – find it hard to understand the deeply ingrained and quite hurtful remarks about Aborigines or immigrants made by older Australians. Yet other young Australians merely grow up repeating the sharply racist and intolerant words they heard spoken in the homes of their parents, grandparents or neighbours, with the advent of the internet and social media simply providing instant quicksilver for the spreading of hurtful, hateful and often downright “untrusims”. Perhaps the biggest irony is that, when it comes to racism, sometimes the shrillest voices are heard from sectors of society that view themselves as somehow ignored, underprivileged or under threat. Their stance, however, is, in reality, a twisted, illogical and unthinking victim mentality that seeks to climb up on the shoulders of those further down the ladder in their eyes. The words and actions of public figures like 2014 Australian of the Year and AFL footballer Adam Goodes – who demonstrate a pride in their culture and support their communities, who call out offensive behaviour or remarks as they happen – challenge such insecure individuals. Those who – like articulate, intelligent commentators Waleed Aly or Charlie Pickering – support Goodes by belling the cat on half-truths or outright lies perpetrated by Goodes’ public and media detractors, also open themselves up to vicious criticism and demeaning remarks. Changing people’s long-held beliefs and assumptions is not an easy task. Sometimes it will take something almost drastic to turn around deeply held prejudices. Three excellent SBS series, Go Back To Where You Came From, have helped achieve a better – and more balanced – understanding of the motivations driving those who seek asylum and should be viewed by all Australians. But the issue of racism reaches far back beyond the public, into the private spaces we habitate, the relationships we value and the day-to-day conversations we have. These often, sadly, lack the recognition of the extent to which our nation is racist and the harm that does. Denying this fact is failing to consider the evidence that has been coming forward for the past decade: from the emergence and support of Pauline Hanson, the United Patriots Front and Reclaim Australia to the often detached debates about asylum seekers, refugees and turning back boats that are devoid of an ounce of humanity. Our nation’s first peoples have been subject to racism – and often far worse – since white settlers set foot on this land. Their “difference” has marked them for derision, distancing and discrimination. Their strengths and achievements have been largely clouded by an undeserved racial stereotyping that attempts to “put them in their place”. But that sort of response belies the ignorance of a proud and noble race with deep links to, and love of, our land. The friendship and many lessons they have to share are mostly lost on the deliberately deaf ears of people too quick to sling insults, intolerance and even hate. What a waste. As an older Australian, have you at times felt unwelcome or even invisible in certain social settings? Have you ever felt that the level of support for older Australians is often unreliable or non-existent, given all that they may have done for our country or their family throughout their lives? Have you felt patronising glances or remarks from younger, more virile or condescending others? Or, perhaps, that your gender has, at times, put you at a disadvantage? How depressing can this be? For those non-indigenous Australians who have experienced these feelings largely only as they aged, take a moment to consider: This – and much worse – is what it has been like for many Aboriginal Australians since childhood and can be what greets new arrivals to our country. That these people can survive such treatment let alone move forward with positivity is something to recognise, appreciate and acknowledge. Isn’t it time the rest of us reached out with respect and recognition to help achieve that aspirational goal of reconciliation, to stand up for all Australians and bury racism in the past? Older Australians are in a uniquely wonderful position to lead the way by example. A still image from the 30-second video segment recorded in mid-2014 for the Racism. It stops with me. campaign. 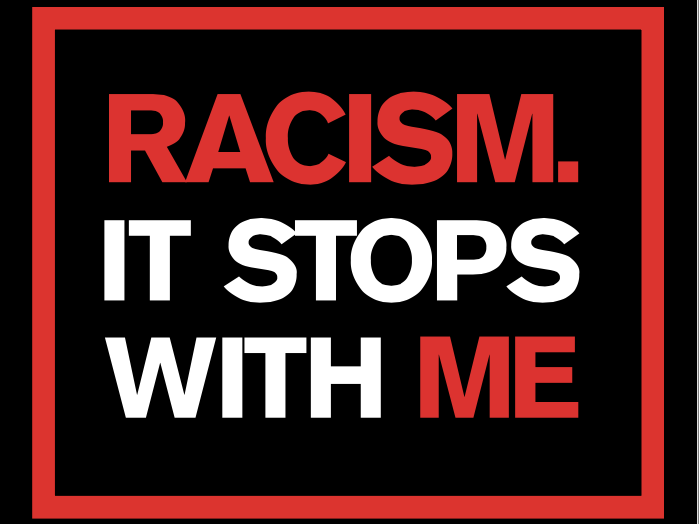 If you’re not sure how, Adam Goodes has been the face of a national campaign: Racism. It stops with me for a few years now. Do have a listen to what he suggests on that 30-second video segment about confronting racist remarks or actions. ← Don’t just sit there and grumble, Mabel, have your say!